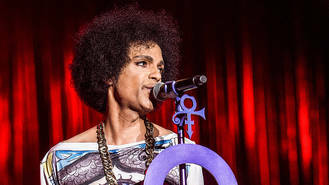 The Purple Rain singer, who died last year (16), famously repped the hue, not only in his song titles and wardrobe, but also on album covers such as 1999 and Indigo Nights, so much so that it became synonymous with the star and his catalogue of classic albums. However, in an interview with Britain's The Evening Standard newspaper, the singer's sister Tyka Nelson has exploded the widely held belief. Images from the singer's public appearances over the last decade of his life appear to support his sister's revelation. In 2016, Prince was pictured at the Grammys in an orange tunic and similarly, he wore an orange suit for his legendary 2007 Super Bowl performance. And in 2006 he wore orange and rocked out with an orange guitar during a Las Vegas residency. Tyka, 57, was speaking ahead of the launch of the star's exhibition at London's The O2 in October, next to the arena where he performed for a record 21 consecutive nights in 2007. As well as the orange Cloud guitar made for his Super Bowl halftime performance and used during his London shows in 2007, fans will be able to see clothing from his Purple Rain and LoveSexy tours, and the Gibson L65 guitar he used for his U.S. TV debut in 1980.
âLondon was the city that accepted Prince the most. It was the obvious choice of where we should exhibit first, it just felt right," Tyka added.